Please note, due to a fire that damaged our farm stand in March of 2015, we are currently without a building but are still offering our delicious fresh produce in our courtyard stand. Thank you for your continued support as we make plans to rebuild. The quality of produce at our Farm Stand is second to none. We feature local in season produce and much of what we offer is grown right here on the farm. Seasonal vegetables, such as asparagus, corn, green beans, squash are piled high for your pleasure and convenience. When in season, you can pick your own strawberries and blueberries – a great way to spend some time with your family. Stop by our deli for our homemade soups feature our farm-grown produce and are made fresh daily. We have many home-made salads and sandwiches as well as deli meats and cheeses for your enjoyment. 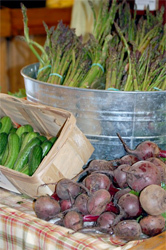 Local farm stands are a window into the world of the people and places that grow your food. There’s nothing like local farm fresh foods, they are boldly brilliant and have more flavor than foods that have to travel across the country to make it to your table. Why not stop by and see one of Rhode Island's best and savor what's fresh from a field near you! Schartner Farms currently provides our fresh produce and products to over Fifty of Rhode Island Restaurants on a weekly basis.